✔️ Did you know? 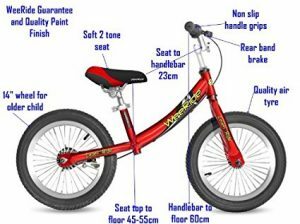 - many kids ovelap the use of a pedal bike and a balance bike, riding both for a period of time. This is because even if they have mastered a pedal bike, balance bikes are so much fun and young children can over go much faster on them. This bike is aimed at 4 to 8 year olds, so there is potentially 4 years of use with this balance bike. It comes with two seat posts for a seat range from 40 to 55 cms so you can adust the seat to the correct height for your child. There's a low centre of gravity for stability and comfort. It features air filled tyres for a smoother ride. And they are great for riding on the path or on the grass. The wheels are 14 inch. The bike weighs around 5.6kg so isn't too heavy for most 4 year olds to control. ✔️ Did you know? - the seat height on a balance bike should measure 2.5cm (1 inch) less than a child's inseam so they can put their feet flat on the floor to push the bike along. 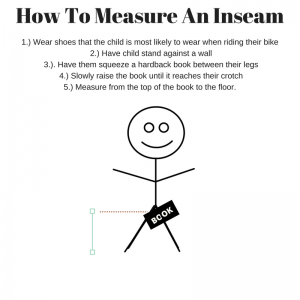 Check how to measure a child's inseam here. The Wee Ride balance bike is another good option. It has an adjustable seat height of 45 to 55cm. To know whether the seat height is right for your child, measure their inseam. Ideally the seat height you want should measure at least 1 inch less than their inseam so that they can get on and off easily and be able to push the bike along with their feet easily. The wheels are 14 inches so perfect for a 4 year old. The bike also features a quick release seat clamp. The tyres are air filled which will offer a smoother ride . There's a rear hand brake for safety too. So how do you make sure the balance bike is the right size for your 4 year old? Firstly you want to make sure that the seat height is the right size for your child. Their feet should be able to fit comfortably flat on the floor on the bike so they can push themselves a long with their feet. They are most comfortable with their knees slightly bent. If the seat height is too tall they want be able to push along and if it's too small they will have to bend their legs too much which will make the bike uncomfortable to ride and their feet may drag along the floor. To make sure the bike is the right height of your 4 year old, measure their inseam (the length from the top of the crotch to the floor with their shoes on.). The right size seat height should be about 1 inch less than their inseam so they can get on and off the bike easily. It is also essential that the seat height can be adjusted upwards so as they grow they will be able to continue to use the bike. Ideally you want a balance bike which has a maximum seat height a couple of inches more than their current inseam so that there is some growing room with the bike. Many balance bikes have adjustable handlebars and seats so they will grow with your child. You can also read reviews of the balance bike you wish to buy to give you an idea of the age range of kids that use the bikes. The Bike star is one of the smaller bikes featured on this page but will still be suitable for the majority of 4 year olds depending on the inseam and height. It has an adjustable seat height from approximately 35cm to 42cm. The handlebar height adjusts from approximately 55-62 cm. The wheels are 12 inch. Find more about the best wheel size further on in this article. It features air filled tyres on high-quality lightweight alloy rims. It weighs approximately 4.8kg which is the perfect weight, lightweight for younger, smaller children to manoeuvre. ​I love that it comes 85% assembled (only approximately 15 minutes assembly work required - always a bonus!). There's a handbrake to save scuffing shoes too. Another thing to consider with 4 year olds is the wheel size. On most balance bikes you will see either 12, 14 or 16 inch wheels.A good guide to which size to get is to look at your child’s height. Measure their height with their shoes on. If they are 114cm or over it’s probably best to go with a 16 inch wheel size. Smaller kids should be okay with a 12 inch wheel size, although at age 4 they may outgrow the 12 inch wheels quickly. The perfect size for most 4 year olds will be 14 inch wheels as they should be okay to ride it straight away but they won't outgrow the bike too quickly. ​The size wheels you get will mainly depend on the child's height. Most 4 year olds will be under 114cm so will be okay with a 12 or 14 inch wheel size but if they are on the taller size you may want to consider getting 16 inch wheels. Strider makes both a 12 inch and 16 inch balance bike both of which could be suitable for a 4 year old dependant on his or her size.The 12 inch bike is designed for kids up to 5 years. The seat height extends from 28cm (11 inches) to 42cm (16.5 inches) but this version of the bike comes with a seat post which extends the seat up to 49cm (19.5 inches). There is also the option of buying a larger padded seat for your kids as they grow. If you have younger children this could be a good buy to pass onto tem after your 4 year old has grown out of it as it can be used by children as young as 18 months to 2 years. The bike has EVA foam tyres which are low maintenance (no pumping up or worrying about punctures). It's very lightweight (only 2.9kg) so easy for kids of all ages to control too. I would say this version of the strider bike would be fine for most 4 year olds. The 16 inch model is designed for older and taller kids. The seat height adjusts from 49.5 cm (19.5 inches) to 65 cm (25.5 inches) so will grow with your child. It weighs in at 8kg, so is better for the taller, heavier child. It has some great additional features that the Strider 12 bike doesn't have including pneumatic tyres which are great for cross terrain and giving a better, smoother ride with more traction. Great for uneven terrain, grass and dirt tracks. It also features brakes and a quick release seat clamp so you can easily adjust the seat. ​A brake on this bike is a good option for older kids. Younger kids don't tend to use a brake much on their bike as it means a lots of co-ordination for them. They will slow down by using their feet or just generally slow down naturally. However, older kids who can grasp the concept of a hand brake may use it more and it also prevent shoes from cuffing if you can get them to use it. It will also get them used to using a brake for when they are ready to transition onto pedals. 38 cm to 47.5cm, (approx 15 to 19 inches).It has airfilled tyres which do offer a smooth ride with better traction than EVA foam tyres. I do think pneumatic tyres are a better option for older kids if you don't mind the extra maintenance. It's a super lightweight option at just 3.75kg in weight. This makes is a fantastic option for smaller and lighter kids who will find it easy to control and move. ​The drop handle bars make it a fun option for kids who want to have a racer feel on their balance bike. This bike has an quality build so will last, a good option to pass down onto younger siblings. The great thing about wooden balance bikes is that they are more environmentally friendly than their metal and plastic counterparts. The wooden balance bike featured has 3 seat height settings, 34cm, 36cm and 38cm. It features proper inflatable rubber tyres which offer a more comfortable ride and traction. It weighs approximately 4kg which is really lightweight. Wooden bikes tend to weigh a lot lighter than metal bikes which means they are easier for young kids to control. Read more about the differences between wooden bikes and metal bikes. A lighter bike is generally easier for small children to control and use. A heavier and taller 4 year old will be able to manage a heavier bike better than a smaller, lighter child. So the ideal weight of the bike will depend on the weight of a child. One rule to follow is look for a balance bike which is around 33% of the weight of your child or less. Sometimes, the more features the bike has (brakes, footrests etc), will add to the weight of the bike although higher end balance bikes may use more expensive and lighter materials. So, look at the weight of individual bikes when you are checking them out. Just avoid particularly heavy ones for your child. The average weight of a 4 year old is 2 stone and 9.5 pounds (17kg), so for the average child you would want to look for bikes that weigh around 5.61kg or less. 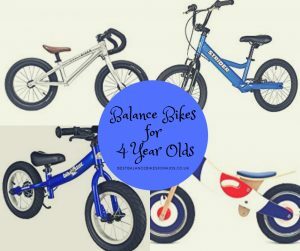 This is a guideline, many balance bikes for older kids are heavier than 5.61kg, so weigh up other features and price when considering which bike to buy. Many fit and strong 4 year olds can manage bikes which are heavier than 33% of the weight. But you will see a huge difference between 12, 14 and 16 inch balance bikes. For example, the 12 inch Strider weighs 3kg while (perfect for younger, lighter kids) whereas the 16 inch Striker is 8kg. You will find the most young children use their feet to stop the balance bike. Very young children don't have the co-ordination to use a handbrake so this will be the ultimate way of stopping the bike. However, the time children reach age 4, they will mostly have the hand and eye co-ordination to use a handbrake. A handbrake can be very good for older children as it can help save their shoes when riding the bike. However they will still be using their feet to make the bike go, so it's instinctive for them to use the feet to stop as well. Some bikes for 4 year olds and older children will have brakes and others may not. It may add a little bit onto the price of the bike. If you have a chance to test the brake on a balance bike, it's a good test to use your little finger on the brake. If you can use the brake with your little finger, it will mean your child should have the strength in their hand to use the brake as well. Ultimately it's a personal decision whether to get a balance bike with a brake. They aren't needed but they can be useful for added safety for stopping and to save scufffing shoes. Pneumatic (air filled tyres) - these will give good traction and are good for riding on all surfaces. They will offer a smoother, more comfortable ride for kids. Some potential disadvantages are that it can add a bit more weight to the bike which makes them not such a good choice for young, small children. Obviously some maintenance may be required to prevent punctures. EVA foam tyres - the great thing about these tyres is that they are puncture proof. They tend to be on lighter bikes and are a good option for younger, smaller children who will just be riding their balance bike along the pavement or on a flatter, smoother surface. The disadvanges are that they aren't the best on other terrain such as grass. If used a lot, the foam can start to wear away. Hard plastic - you will see some bikes with hard plastic wheels. These are lightweight but will be much less comfortable to ride. They will be best for indoor use. If you already have a pedal bike for your 4 year old another option is to lower the seat on the bike to the lowest possible setting and to take off the pedals (there are lots of videos on youtube showing you how to do this). They can then use the bike as a balance bike and when they have mastered balancing you can put the pedals back on. The only downside with this methods is that pedal bikes tend to be a lot heavier than balance bikes and it may be a little difficult for some 4 year olds to balance, manoeuvre and control this type of bike. But it may be worth giving it a go.